We are very proud to announce that Al Hasenfratz of the Sylvania Township Service Department has been awarded 3rd place as the Firehouse Magazine – Emergency Vehicle Technician (EVT) of the year. Nominations were received from across the United States for this year’s award. The EVT of the Year Award was created in 2004 to recognize the dedication and professionalism of men and women committed to the safe operation of emergency apparatus and support of emergency responders and their communities. Al has over 30 years in vehicle repair, starting in Sylvania in 2005. He is the Northwest Director of the Ohio Association of Emergency Vehicle Technicians. Al is ASE- and EVT- Master certified and serves as an alternate to the National Fire Protection Association (NFPA) 1071 Committee. NFPA 1071 is the Standard for Emergency Vehicle Technician Professional Qualifications. Congratulations to Al for his hard work and dedication to Fire Department vehicle maintenance and repair in Sylvania. …the temperature is falling, WINTER is here! With snow & cold outside means we want it warm and fuzzy inside. How we heat our house and use our appliances can mean the difference in a warm and safe house, or one where the fire department needs to respond. 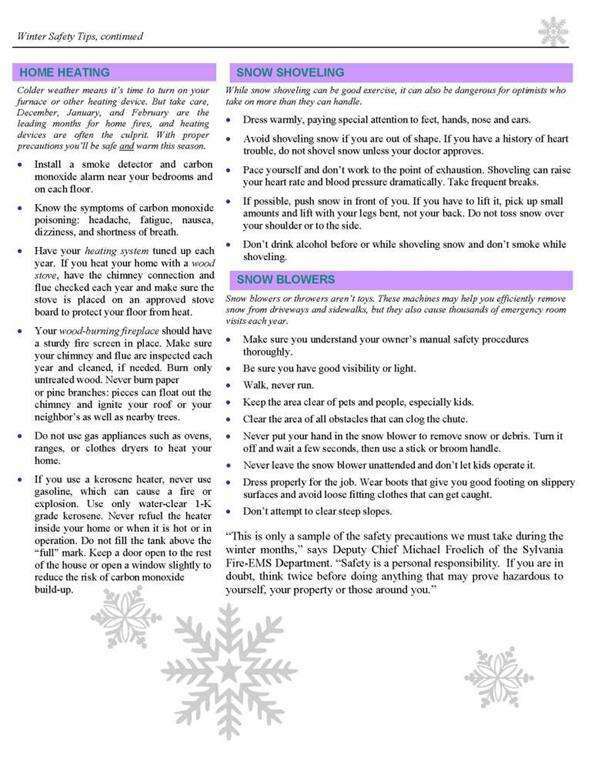 Please read our latest tips – on Winter Safety Tips. version for better viewing and printing. 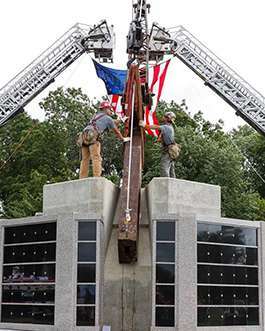 On Sept. 10, 2016, a day before the 15 year anniversary of the attacks on the United States at the World Trade Center in New York, the Pentagon in Washington D.C and in the air over Pennsylvania , a piece of the World Trade Center North Tower was delivered to Toledo Memorial Park and set in place to honor area First Responders and all those who lost their lives in these attacks. Fire Departments and Law Enforcement agencies from the area took part in this service. The photos are courtesy of Jeremy Maddux, Firefighter / Paramedic with the Sylvania Fire-Ems. Sylvania FIRE-EMS has completed an improvement project at Firehouse #4, 8210 W. Sylvania Ave. 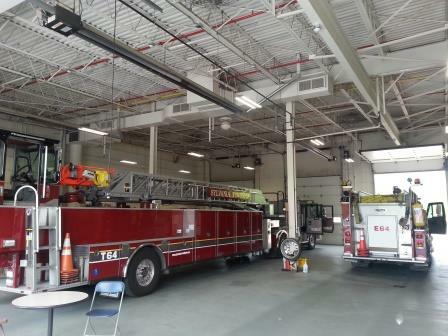 The fire department had all 72 florescent lights in the apparatus bay removed and replaced with just 16 LED lights. These new lights will result in an 86% reduction of energy usage, double the light in the bay and through the energy savings, pay for themselves in 4.1 years. The new lights also carry a 10 year inclusive warranty. Equipment and vehicles powered by internal combustion engines are a common source of carbon monoxide. Vehicles running in an attached garage or generators running inside a home or attached garage, can quickly produce dangerous levels of carbon monoxide. The dangers of CO depend on a number of variables, including the person’s health and activity level. Infants, pregnant women, and people with physical conditions that limit their body’s ability to use oxygen can be more severely affected by lower concentrations of CO than healthy adults would be. 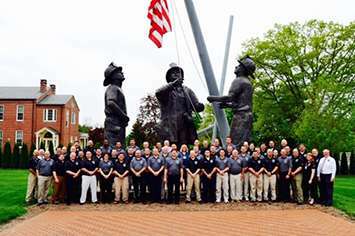 The Sylvania Township Fire Department is better prepared to fulfill its mission of service to the Sylvania community, following an advanced leadership and management training program offered by the United States Fire Administration’s (USFA) National Fire Academy (NFA) in Emmitsburg, MD. Captain Aaron M. Frye represents the Sylvania Community, the Sylvania Township Fire Department and the great State of Ohio as the only Ohio candidate to be selected as a Charter Member of the National Fire Academy’s Managing Officer Program. It is a multi-year curriculum that introduces rising emergency services leaders to personal and professional skills in change management, risk reduction and adaptive leadership. The Inaugural Managing Officer Class (MO-1) consisted of 53 members. These Fire and EMS Officers were selected out of a highly competitive pool of over 300 applicants, and have accepted the challenge to assist in developing this ground breaking program for the future of the United States Fire Service. • Five prerequisite courses (online and classroom deliveries in your state). • Four on-campus courses at the NFA in Emmitsburg, Maryland. • A community-based capstone project. A certificate of completion for the program and the designation as a Managing Officer (MO) is awarded after the successful completion of all courses and the capstone project. • Be better prepared to grow professionally, improve their skills, and meet emerging professional challenges. • Be able to embrace professional growth and development in their career. • Enjoy a national perspective on professional development. • Understand and appreciate the importance of professional development. • Have a network of fire service professionals who support career development. Captain Frye has completed the first module of the two-year program. He has learned advanced leadership and management principles that will support the mission and vision of the Sylvania Township Fire Department, and at the same time preserve the important vitality and quality of life of Sylvania. The National Fire Academy was created as a result of the landmark document “America Burning” and the subsequent passage of the Federal Fire Prevention and Control Act of 1974. It is estimated that, since 1975, over 1,400,000 students have received training through a variety of course delivery methods. The American public has greatly benefited from the training and education programs provided by USFA and NFA. Countless lives have been saved and property losses prevented as a direct result of this training and education. OUR FIRE DEPARTMENT MECHANIC IS ONE OF THE BEST!!! 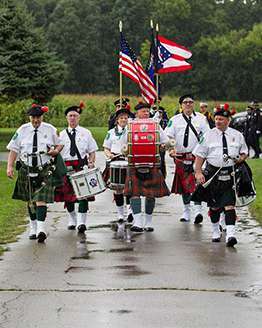 the following story is from the Toledo Blade – Our Town Sylvania! With 30 years of experience working in vehicle maintenance, mechanic Al Hasenfratz has found his niche as a fire-apparatus technician with the Sylvania Township Fire Department. Mr. Hasenfratz is one of only 615 mechanics in the United States and Canada to hold master certificates with the Automotive Service Excellence group and the Emergency Vehicle Technician Certification Commission. He’s one of four mechanics in the Sylvania Township service department and the only one qualified to work on fire trucks. His background and training makes him valuable to the fire department. In February, Mr. Hasenfratz was invited to serve on the committee to review the national F5/​Aerial Apparatus test at a commission conference in Orlando. There he helped review statistical data and write questions to improve the test. Mr. Hasenfratz is also on the board of directors of the Ohio Association of Emergency Vehicle Technicians and goes to annual training at the Ohio Fire Academy in Reynoldsburg. Last year, Mr. Hasenfratz was appointed to the National Fire Protection Association 1071 committee, which oversees professional-standards documents for technicians. As new technology has developed over the past 10 years, Mr. Hasenfratz has kept up with his certifications and adapted how he deals with the fire trucks. “I’ve been working here in the department for 37 years and I can’t recall knowing anybody from the shop that has a better understanding and ability to problem-solve than Al,” Chief Kowalski said. You may wonder what your Sylvania firefighters do all day. 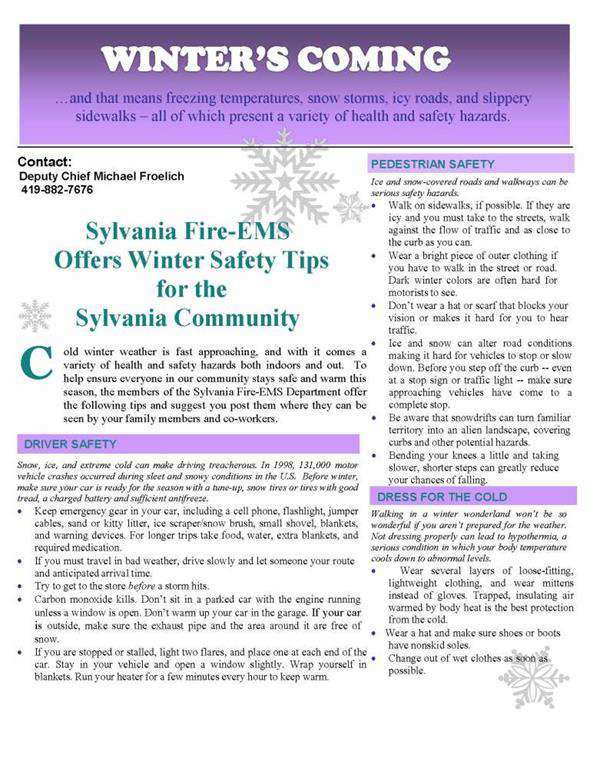 We would like to give you a glimpse inside the daily life of a Sylvania firefighter with our three part series “A DAY IN THE LIFE OF THE SYLVANIA FIRE DEPARTMENT“. The Safer Ohio Initiative, which incorporates a comprehensive strategy of emergency preparedness to enhance the state’s readiness before an incident happens, during an incident and after an incident occurs is being fully implemented with the announcement of the new Safer Ohio Phone App, a component of the Safer Ohio Initiative. 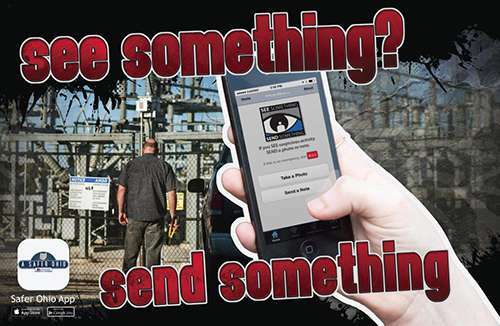 This App has the “See Something, Send Something” function, which allows people to report information and send photos of suspicious activity to Ohio Homeland Security. Also available on the multi-functional App is a button for connecting with a 9-1-1 dispatcher, a function which dispatches the Ohio State Highway Patrol or other law enforcement officer to a non-emergency traffic situation, and connection with the Ohio Department of Transportation’s OH-GO application for real-time traffic reports throughout Ohio. The free App is available for both Android and Apple devices, and we strongly encourage you to download it today. A new video tutorial to assist you in navigating the App is now available at the following link: http://youtu.be/qv9CZNFHYrs. 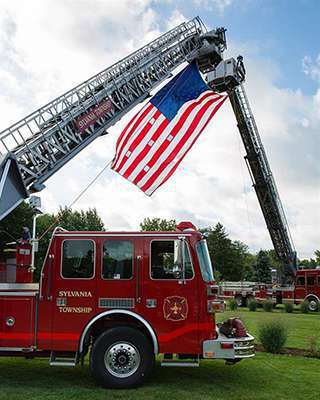 The Sylvania Township trustees have adopted the 2011 Ohio Fire Code. With the adoption of this code, the Sylvania Township Fire Department will start requiring a permit and charging fees for certain activities. Permits will be needed and fees charged for tent and burn permits as well as for plan review for building construction, fire sprinkler systems, fire alarm systems and commercial kitchen hood suppression systems. The fire department will also be charging non-compliance fees for commercial building inspections. The initial fire safety inspection will not be charged. If fire code violations are found, a return re-inspection is required. If the fire code violations are found corrected, there will not be a fee. If the violations still exist, a $50.00 fee will be charged. When fire inspectors return again and the violations continue to exist, another fee is charged and the fire department will contact the prosecutor’s office to start legal action. The fire department will also charge for malfunctioning fire alarm systems. After 3 responses to a malfunctioning fire alarm within a one year time period, any subsequent responses that are determined to be a system malfunction will be charged. All charges are at the discretion of the Sylvania Township Fire Department.